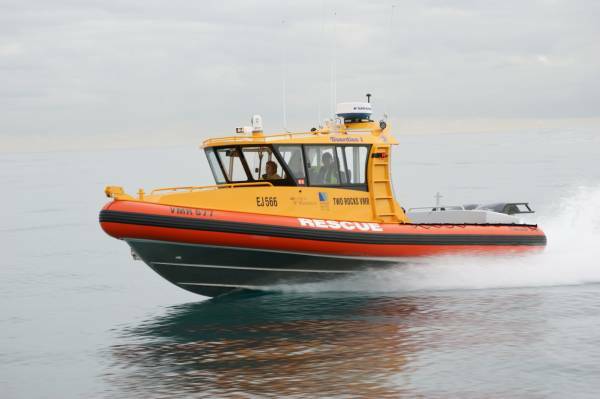 ‘Guardian 1’ is a Kirby Naiad rigid inflatable, and its 8.5m hull has been used for seven other WA sea rescue boats, but this is the first with a lock up cabin. 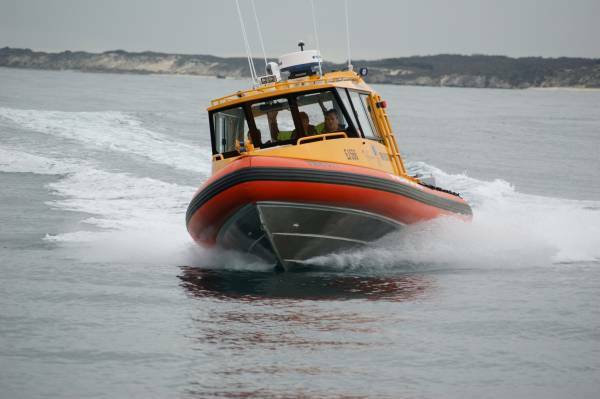 Rescue boats normally live on trailers, and previous 8.5s have soft canopies for, among other reasons, reduced weight. Two Rocks Sea Rescue does not have secure parking ashore and have to keep their boat on an air lift in the marina; security demanded the boat be lockable as well as fitted with alarms. The new wheelhouse structure puts plenty of volume under the foredeck giving room for a toilet and storage for the masses of specialized gear that has to be carried – oxygen, defibrillator and spinal stretchers among other items. The stretchers are used even for uninjured people when getting them out of the water: they make the operation much gentler than simply dragging over the side tubes. The cabin and bulged foredeck leave room for side decks and a workable platform forward. An almost extravagant number of grab rails make the transit safe. Apart from the grab rails, the wheelhouse roof has barely room for all the specialized gear: five radio aerials, GPS antenna, radar scanner, spotlight, and what looks like a mini Vulcan Phalanx gun. This is the FLIR, the forward-looking infrared scanner, which even has a remotely operated zoom lens. All the information produced by these electronics is selectively displayed on the two 10-inch Furuno Navnet screens in the wheelhouse, one each for skipper and navigator. The sophistication of Navnet allows the 48-nautical mile radar picture to be overlaid on the plotter picture. Nothing replaces the Mark 1 eyeball, of course, and the wheelhouse has a vast glass area, with forward-raked windscreens for reduced reflections and heat gain. The navigator needs to be on the ball not only with his screen and windows but also with his kit of radios. Two VHFs, a UHF and a 27MHz. No HF as, not only is there almost zero HF traffic locally, but it requires an unwieldy aerial for good results. 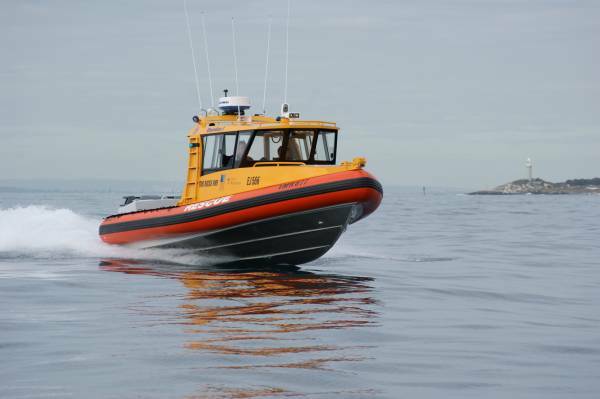 Both key crew members have KAB suspension seats, the kind cray boats use and that over the years have deterred wear and tear on thousands of backs. Anyone standing behind them and taking advantage of the abundant overhead grab rails gets surprisingly good cushioning from the fatigue membrane laid over the deck. Or instead of standing there is a folding lounge at the transom. To give plenty of working room in the cockpit the tow point has been placed in the splash well instead of on a central tow post. On the principle of a place for everything, the tow rope has its own bin behind the rear seat. In use, the tope rope is prevented from fouling the outboards by a combined rope guard-crash frame. To reduce the chances of the outboards fouling any diver deployed, a boarding ladder is fitted each side amidships, folding neatly up against the wheelhouse. Clearly ‘Guardian 1’ has practicality, and with Naiads the sea keeping is virtually a given. 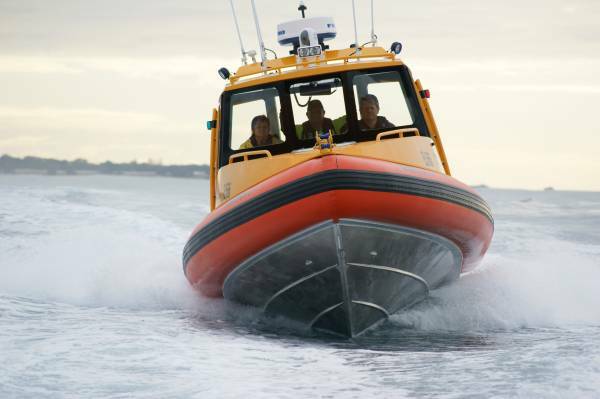 A 23-degree deadrise on a narrow aluminium hull provides the basics of a good ride, with the inflatable collar providing reserve buoyancy for when the bow hits hard. Although hitting hard is a rarity because the inflatable collar acts as a shock absorber. As expected the extra weight of the wheelhouse took some of the edge off performance (although 47 knots from the twin 250hp Yamaha four-strokes is hardly foot dragging), but it also had a pleasant side benefit. 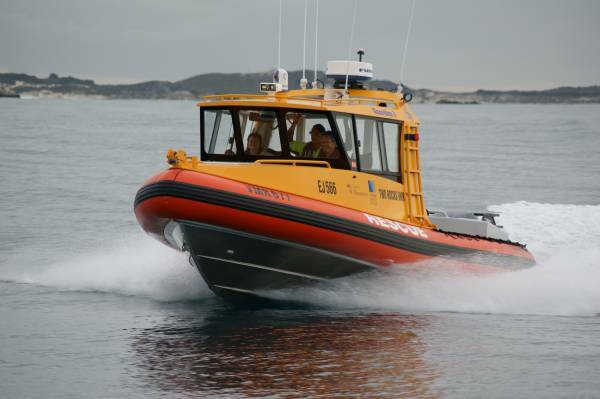 A little extra weight often enhances a boat’s rough water ability, and ‘Guardian 1’ in a straight comparison with a soft top 8.5 showed a small edge into the sea: a further reduction of fatigue on long searches. Fun is hardly a rescue boat requirement, but all on board could have been accused of enjoying themselves during the trials. Response to the throttles was instantaneous, as it was to the wheel. This boat will turn hard enough at speed to displace internal organs, and do it without a trace of slip from the hull or the propellers. It would certainly make the basis of a great leisure boat. It has open space and top class shelter, ridiculous quantities of stability, and a fit-out and finish superior to almost anything on the market.